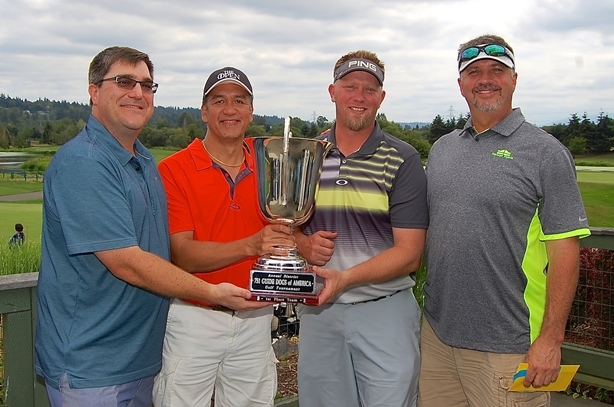 The winning team from the 2016 Guide Dogs of America Charity Golf Tournament: (from left) Jerod Gillies, Marvin Rosales, Casey Schmidt and Scott Chord. Their best-ball score of 56 for the round gave them a one-shot edge over the second-place team. IAM District 751 held their 25th Annual Guide Dogs of America (GDA) golf tournament recently, raising more than $17,000 for the IAM’s favorite charity. One hundred thirty-two golfers turned out for the yearly golf outing at Willows Run Golf Complex in Redmond, WA. According to a recent Redmond Reporter article, District 751 is one of the top fundraisers for Guide Dogs of America. Over the past seven years, the union has raised more than $2 million for the charity. Guide Dogs of America provides guide dogs to blind and visually impaired men and women in the U.S. and Canada and charges nothing to recipients or their families for the many services and items required. These include a fully trained guide dog, a specially designed harness, instruction by GDA’s professionally licensed trainers, on-site room and board for the 28-day instruction period, veterinary and follow-up care and necessary travel expenses. GDA receives no government funding or support. It costs approximately $42,000 for GDA to create a successful guide dog team.